Large families invariably command respect from the people around them: the education of children has always demanded serious material and moral efforts. The government, seeking to help large families and provides them with numerous benefits and cash benefits. According to Russian law, large families are the families raising more than three minor children. Every large family has a right to benefits and payments to make life much easier for parents and to reduce everyday costs. In addition to Federal programs to support large families, there are also regional payments and subsidies. Since 2013, families where the income level of each family member is below the average for the region, after the birth of her third child entitled to monthly payment in the amount of 6 to 11 thousand rubles. Increased monthly allowance is paid in 53 regions of the country, and also in the Altai, Kamchatka, Krasnodar, Primorsky, Khabarovsk and Stavropol territories. Any large family, regardless of the level of life you to receive a monthly allowance for child care in the amount of 5 153 p. in addition, for each child, parents receive an additional allowance as compensation for the costs associated with rising prices on food and education of children. If the family is not more than 4 children, the size of the additional payments is 600 rubles. If the family has more than 5 children, for each child, parents receive 750 roubles. Large families with 5 and more children, the state also provides General benefit for the entire family to purchase children's goods. In 2014 the allowance was 900 rubles.If the family has small children up to 3 years, monthly payment of $ 675 rubles to offset the cost of food. Also, large families are compensating benefits for the payment of household and utility services. For compensation of utility costs for families with 3-4 children allocated monthly 522 rubles, and families with 5 and more children – 1044 ruble. For payment city telephone number allocated monthly for 230 rubles. Families with 10 children or more are entitled to additional annual payments in the amount of 10,000 rubles. Also the allowance of 10000 rubles can claim to be mother of 10 or more children receive a pension. Lump-sum payment in the amount of 100 000 roubles will receive families with 7 and more children. Parents also is awarded the order of Parental glory. 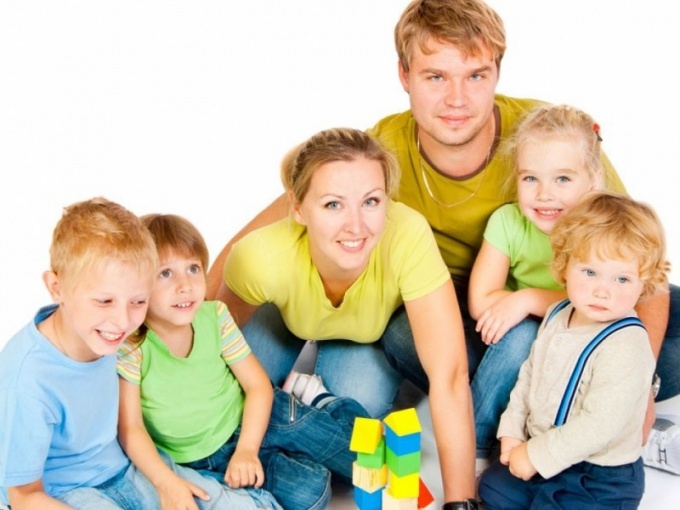 Large families can not only receive financial benefits but also to enjoy the many benefits. Preschool children eligible to enroll in kindergarten without turn, the students in educational institutions receive free meals. In addition, preschoolers from large families can be serviced without Queuing at the clinics are eligible for free medications and vouchers to health centers and dispensaries. Children older than 6 years, the government compensates the funds to purchase school and sports uniforms.